We write ‘ough’ but how do we pronounce it? 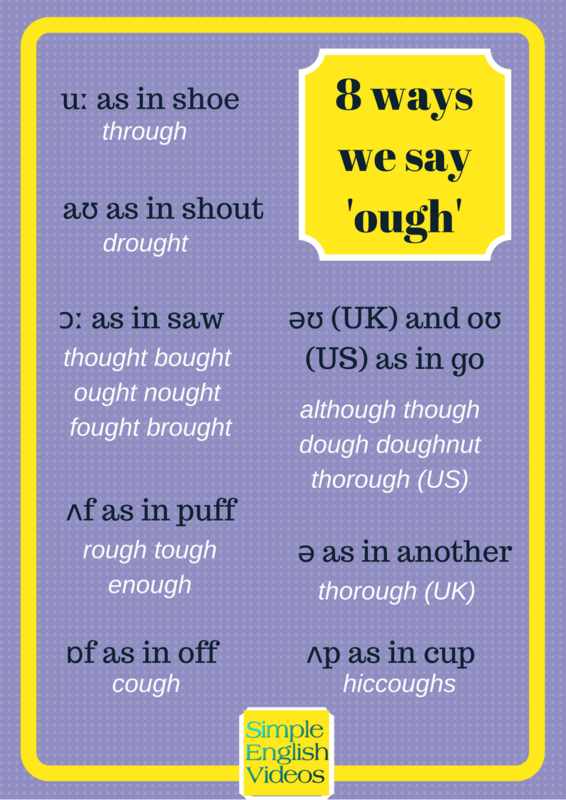 In this lesson we look at eight different ways we say the letter combination ‘ough’. We’ve also made a reference chart that you can download for free by clicking here. Hi, today we’re going to look at eight different ways we pronounce these letters in English. For those that don’t know us, I’m Vicki and I’m British. And I’m Jay and I’m American and today we also have some English learners to help us. We’re looking at how we pronounce this letter combination in English, because it has lots of different sounds. So here’s your first task. Listen to our learners say two words, and work out what sound the letters make. Yes. Now, what was the sound? Thought – bought – that o-u-g-h is an aw sound – like in the word saw. Are there other words like that? Yes, how do you think we say this word? Out? Owout? Ooch? No? Ought. Ought. It’s that aw sound again – ought. So you OUGHT to so remember it. Here are some more words with this sound. Nought – like the number zero. Brought – the past tense of bring. And fought – the past tense of fight. They all end with the letter T.
So if a word ends with T, we say aw – awt? Erm, not always. There’s an exception – drought. Yes. A drought is a long period of time when there’s no rain. So for o-u-g-h we say ow. Yes, ow. Drought – like in the word shout. OK, what’s the next sound? Through – it’s an ooo sound. Yes, through – like in the word shoe. Ooo. Stay with us and we’ll get THROUGH all the sounds. OK, the next word looks very similar, but the sound is very different. If we do something completely, we’re thorough. And when we pay attention to detail we’re thorough. You say oh, like in the word row, and I say eh – just a little schwa sound – thorough. This was hard for our learners. Halthoughth? Althougth? Althuth? Although. Although? Oh my… Although. Although. Our learners were terrific and we want to say a big thank you to them all. And the word was although. We use this when we’re introducing something surprising into a conversation. ALTHOUGH the word was difficult, they still tried to say it. And sometimes we shorten it and we just say ‘though’. Er thoughth? Thougth? Though. Toe? Tuth? Though. Though. Though. Now the o-u-g-h sound was oh – like the word ‘go’. Are there any other words like that? Yes. There’s dough – dough is a mixture of flour and water that we use to make bread. And there’s also this word. Doughnut? Ah, doughnut. Doughnut, not that’s… yeah. Doughnut. Doughnut. That one I know. You can also spell it like this. That’s how we usually spell it in American English. So there’s although, though, dough, doughtnut. O-u-g-h is an ‘oh’ sound. Cough. Cough. Cough. Cough. Cough? OK, cough. Cough – it’s an ‘off’ sound – like in the word off. Cough is what you do when you have a bad cold. But there’s a similar word with a different sound. I have no idea what this is but hic coughs? hiccoughs? No. She got it. It looks like cough but we say hiccups. So here the sound us ‘up’. Now there’s another way to spell this word. Yes. Usually we spell it like this but you’ll see both spellings. I’ve got two words for you. What’s the sound? OK, so rough. Rough. Rough. Tough. Tough. Tough. That wasn’t too tough – they did well! Rough – tough – it’s an uff sound. Yes, like the word puff or cuff. So have you had enough? I think so! Eight different sounds for o-u-g-h? English is hard. English is hard. You can understand it through tough thorough though though. Thought! THought! THought! English is hard. You can understand it through tough thorough thought though. We should write a song about it. If you want more practice with the sounds and spellings in this video, I’ve made a chart for you. It’s free and I’ll put a link in the details below. If you enjoyed this video, please give it a thumbs up. And help a friend whose learning English. Send them a link. Please subscribe to this channel if you haven’t already. And see you all next Friday everyone. Bye!